Mary is happy…happy! It was a happy evening recently at knitting workshop…she completed the knitting journey of the Tomten Jacket, a Elizabeth Zimmerman design. 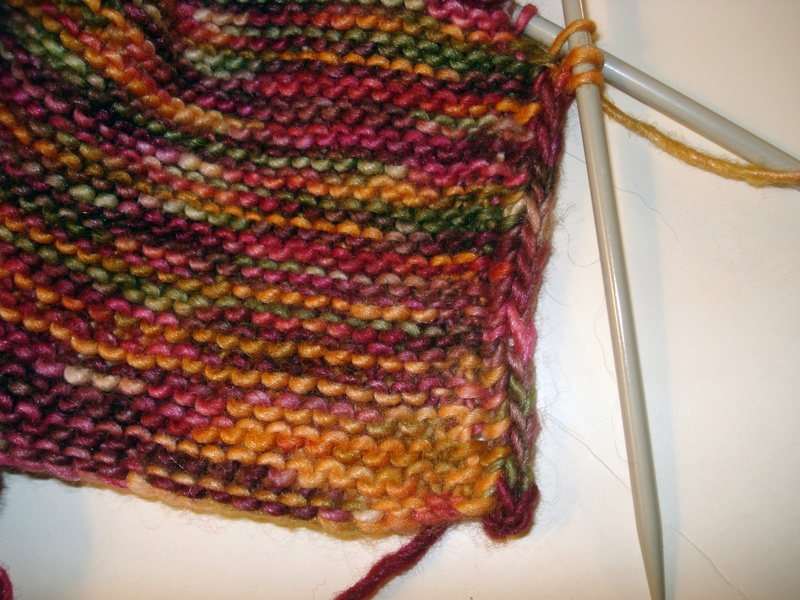 She knit this garter-stitch design in Brown Sheep Lambspride Superwash. 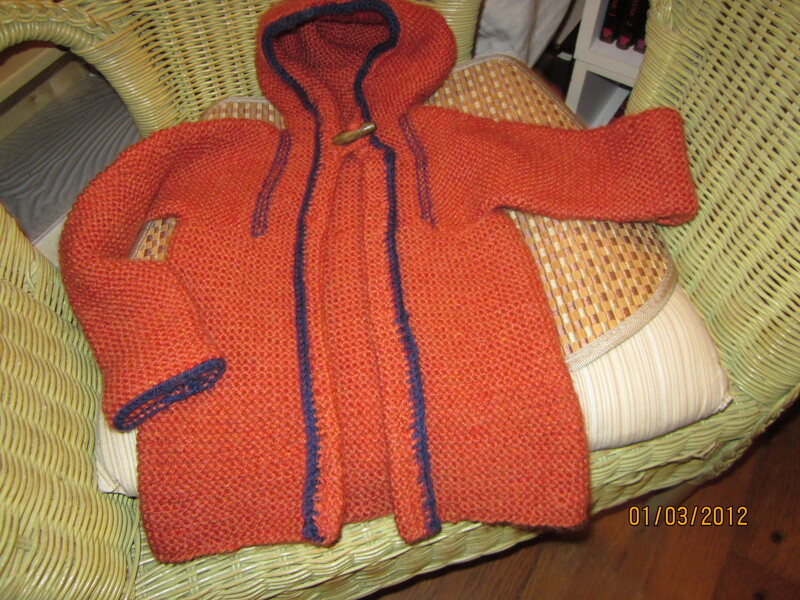 She began this sweater for her granddaughter…..time slipped away…and now her neighbors have been gifted with this lovely sweater for their newly adopted child. As you can see Mary was overjoyed to complete this project….she stuck with it and you can see the results. The detailing that makes this Tomten unique is that Mary rolled the edging back and tacked it all around. She also created an I-cord loop for the toggle button. Yeah! I finally got the buttons on the Tomten hoodie, a Elizabeth Zimmerman classic design, for Carson….wrapped the present….popped it in the mail along with bracelet presents for Carson’s three sisters aka my nieces. How much fun to receive an instant message from my sister today….thought I’d saved it….but no! In the package was LaBerta’s Rudolph the Raindeer golden book from when she was a wee one her self, a baby sweater for Carson, and bracelets for Isabella, Jade, and Abygail. I’ve just gotten home and there is a package on my door step…. the girls will be home from school soon and they can open their presents. This sequence of messages made me smile…..and made me really happy that I’d knit the sweater….thanks to my knitting friend Cathy for crocheting the beaded bracelets for the girls. As I was thinking about this post tonight, I googled “Tomten Jacket” and got many links. 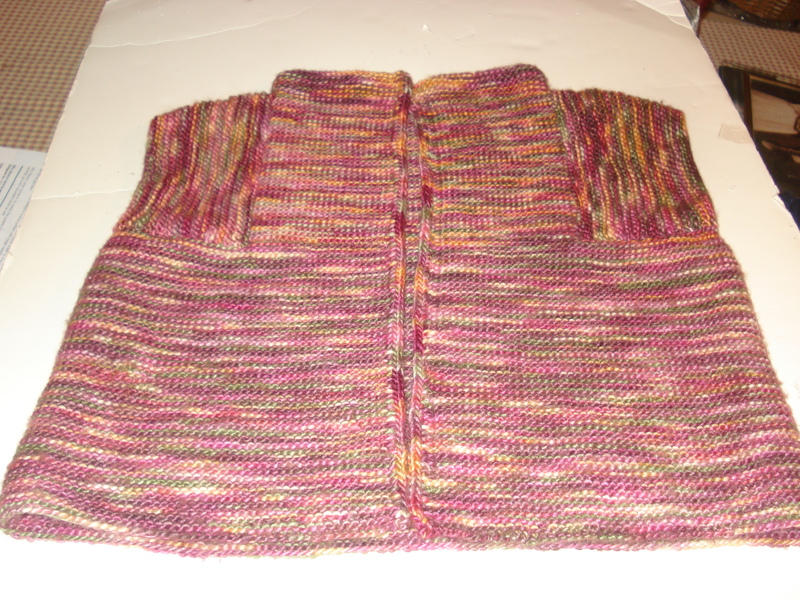 It was fascinating to see how many different ways that this modular sweater has been knit. I think Elizabeth must be looking down upon us and thinking “What a joy to see such creativity from my simple design.” Many different edges have been used to finish the garment…Elizabeth’s vision was I-cord…and I used that on Carson’s sweater. I then crocheted loops for the buttonholes and added the buttons on the opposite front. I even made an effort to have the buttons on the “man’s side”. Mothers tell me if this helpful or an annoyance. Some of the other choices for bands that I saw were: garter band with button holes, zipper, a rufffled edge, a crocheted edge…and as always the possibilities are endless. My choice for Carson had to do with wanting to work an I-cord edge for this garment….and then I fussed about the edging for the button holes. I knit this sweater jacket in Brown Sheep’s Cotton Fleece trimmed with Brown Sheep’s Superwash Lamb’s Pride…..both of these being two of my favorite yarns. 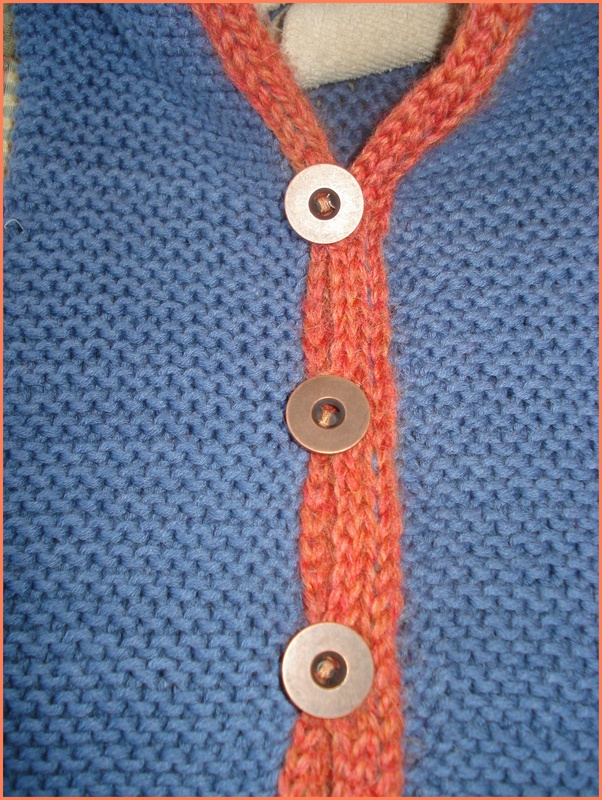 Tomten Sweater Jacket - the buttons! 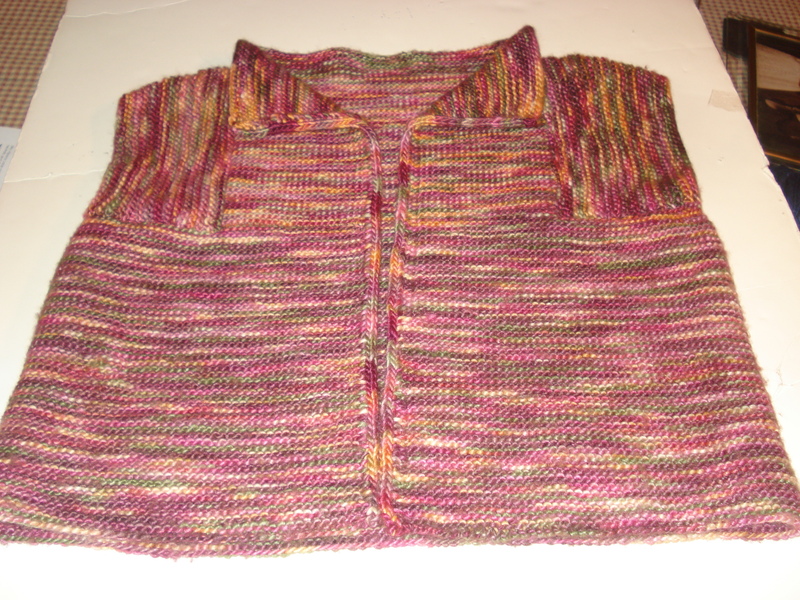 Karen had been to Stitches on Friday…and she purchased a dynamite pattern Liesel from CocoKnits. This vendor/designer had models to try on of the patterns that she has designed….lovely…lovely…lovely! Karen was so excited with the design and she found the yarn specificed in the pattern, Euro Flax Linen. Not only is Karen H excited but so was Karen K from our Skein Lane knittng circle as well as myself. I tried Liesel on and I felt quite trendy! I have some Euro Flax Linen in my Skein Lane inventory…it’s red and I think it will be stunning. 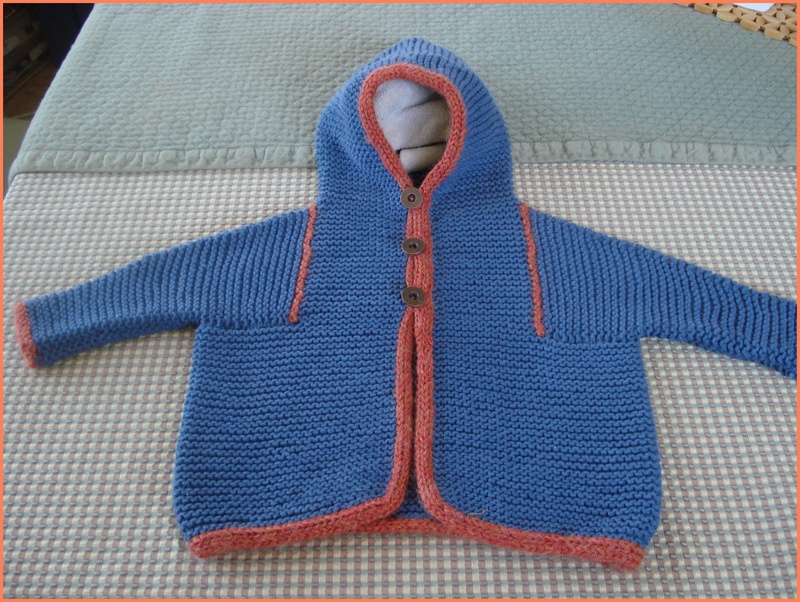 I will embark upon it as soon as I finish the Tomten sweater jacket, a design by Elizabeth Zimmerman, for my newly born nephew, Carson Louis…..Louis is our dad’s name! Brings a tear or two! 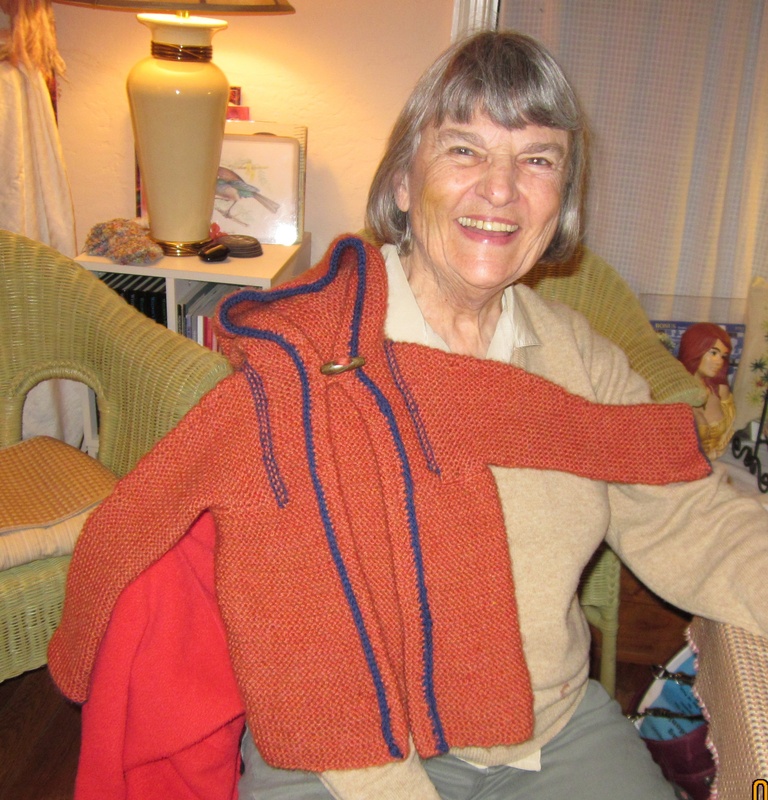 I am pointing you to Meg Swansen’s site to learn more about the Tomten Sweater Jacket and Elizabeth Zimmerman – Meg’s mother. During our 4-hr sprint Karen took Connie and me to the CocoKnits booth…and we both fell in the designs…just as Karen had. 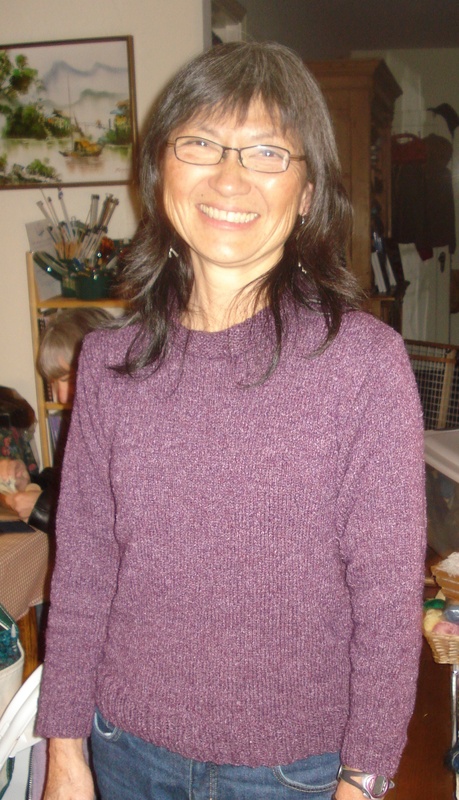 Connie tried on Carlie, seen below, and she then went shopping for the yarn – Elsbeth Lavold’s Silky Flame. Her color choice was a red-orange. It’s beautiful and Connie will look terrific in it. More to come in the next post!